Yekaterinburg, Russia’s fourth-largest city is situated along the eastern side of the Ural Mountains. This city, which has been an important center for industry and culture since the start of the 20th century, just continues to grow. Named after Catherine I, wife to Russian Tsar Peter the Great, Yekaterina was founded in 1723. The last Tsar of Russia, Nicholas II, was also executed here after the end of the famous Russian revolution. Yekaterinburg experiences rain in every season and the winters months have seen freezing temperatures. In summer, temperatures vary between 15-20 degrees and the most ideal months to visit the city are July and August. *We do not have Yekaterinburg flights for a while. If you want you can use flights to Moscow then transfer to Yekaterinburg by land. The flight distance between Istanbul and Yekaterinburg, a city set on the Iset River and located on the eastern side of the Ural Mountains, is 2,883 kilometers. With an Istanbul-Yekaterinburg flight ticket from Pegasus you can arrive to Yekaterinburg by transferring in Bishkek. If the time of the landing of your Yekateriburg flight is important then make sure you don’t forget the time difference as Yekaterinburg is three hours ahead. You can find an especially reasonably priced Yekaterinburg flight ticket during discount season. Inner city Yekaterinburg transportation is done by tramway, metro, trolleybus, bus and taxis. The public transportations is so well developed in this city, which is one of Russia’s major industrial centers, there are 30 different tramlines alone. You can obtain a city guide that explains all of the routes available in detail at the central Yekaterinburg tourism office. The eating out culture in Yekaterinburg is quite diverse and appetizing. An extension of the Russian culinary tradition, in Yekaterinburg cuisine, meat dishes take the forefront. With hunting being one of the most widespread pastimes in Russia, it is very possible to come across nearly every type of game meat; rabbit, deer, duck and goose meat are all just some of the specialty meats the locals love most. In Yekaterinburg, both Russian cuisine as well as international cuisine are high in demand. With restaurants sprinkled throughout the city, they all compete heavily to best serve their customers. If you want to try some of Yekaterinburg’s favorite dishes then try their meat piroshki, a popular type of savory pastry. Known for being one of Yekaterinburg’s best restaurants with its expert chefs specializing in Russian cuisine and its friendly staff, Pashtet is famous for its smoked omol fish, which is a must-try if you go. Due to both its English menu and staff that speak the language, Khmeli Suneli is a restaurant in which you will have no difficulties communicating and it stands out especially for serving up Georgian fare. If you are wondering where the city’s best grill specialist is located, let us give you the address: Stroganov-Grill. In addition to tasting perfectly cooked meat dishes, those who prefer can also choose from their wide selection of local Russian favorites. Serving up classics from Czech cuisine and with their appetizing selection of drinks, Pan Smetan is considered one of the city’s most popular in demand restaurants. With a menu combining Japanese and European cuisine, Panorama A.S.P. is located on the 50th floor of the Visotsky high rise. The restaurant has an amazing view and it feels like you are sitting above the city as you dine on your meal. 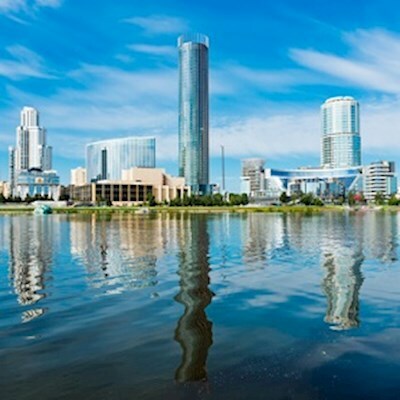 Yekaterinburg is a relatively large city and there are a wide number of commercial venues spanning from local operations to mega shopping complexes spread throughout the city. In the Yekaterinburg shopping world, the leather trade especially stands out and you can easily find all sorts of products made from leather. If you are looking for Yekaterinburg souvenirs for your loved ones, then head for the pedestrian Vaynera Street. Although its appearance is similar to a small museum where you could acquire information on the city’s history, Metenkov’s House also has a beautiful selection of photos on display. This gallery, where you can admire precious artifacts from the Russian Empire, also regularly holds contemporary exhibitions. This modern art gallery, which also has a cafe, has one of the coziest environments in Yekaterinburg. This is also a place where you can find precious works made by local artists. This mega shopping center, which also houses an amusement park and an ice skating ring, gets especially crowded in the winter season. This complex, which is also outfitted with a wide variety of brands also has a number of appealing cafes. First built as a small shopping center, Greenwich has transformed into a major shopping complex. Not only does it contain worldwide famous restaurants and shops, but there is also a huge market. With internationally famed five-star hotel chains as well as more budget hostel options, Yekaterinburg offers a wide range of accommodation to ease any travelers’ mind. Although the costs rise the closer you get to Yekaterinburg city center, for the most part, Yekaterinburg hotels are reasonably priced. Located just 5 minutes from the city center and with its pool, spa center and room service, the Hyatt Regency offers its guest the ultimate in comfort. Standing out for its extraordinary architecture, Onegin Hotel offers accommodation with a stunning city vista. The hotel also has a spa center, free parking, room service, restaurant and high speed Wi-Fi service. Situated in a central location, Park Inn by Radisson has a conference hall, free parking, room service and Wi-Fi. This hotel also allows pets to stay. Located just 15-20 minute walk from the city center, Senator Business Hotel is the ideal choice for those who want to stay in a quiet environment for a reasonable price. If you do choose to stay in this hotel, then you need to let them know what you would like to have for breakfast the night before, just keep that in mind. With spacious rooms and friendly personnel, Panorama Apart & Business Hotel, which is one of Yekaterinburg’s best hotels, is more like a living space complex as this hotel has a number of common areas, shops and sports centers. With its rich cultural tapestry, a history spanning back to the early 18th century and now a colorful modern city, there are many places to see in Yekaterinburg. The touristic sites in Yekaterinburg are predominantly centered around religious buildings as this is where the country’s most magnificent cathedrals and churches were built. This church, which happens to be the city’s largest, also goes by the name Church of All Saints. It was built in 2002 in the site of the home where Russia’s last Tsar Nicholas II was murdered by the Bolsheviks. The construction of the Church of Ascension, located on one of the city’s highest peaks, lasted 100 years. The sole baroque style building left standing in Yekaterinburg, it still serves as a place where the Orthodox go to worship. This outdoor structure designed by Anatoly Vyatkin was opened to visitors in 2005. Consisting of a keyboard, this monument is now one of the city’s most popular touristic spots. One of the biggest art museums in the Urals, the Museum of Fine Arts first opened in 1936. This museum, which hosts both traditional and modern exhibitions, also houses the most important works in Eastern European art. One of the biggest expanses of nature in the city, Dendropark has a number of bird and flora varieties. This park, which gets especially crowded over the weekend, also has a pond where visitors can feed the ducks and swans. Address: Located between 8th March Street and Kuibsheva Street. The nightlife in Yekaterinburg is yet another factor that draws in visitors to the city. In the summer months especially, the lights never go out and people can have a full night out at the nightclubs and bars in the city, more and more of which continue to open up every day. Coyote Ugly, which has collected the most beautiful girls in the city as their staff, is a nightclub where you can meet new people while listening to the latest hits. Considered one of the best karaoke bars in the city, Zapoi has considerably reasonable prices and a great sound system.